Drink in the spectacular views of the Lebombo mountains with the Msunduzi river winding below from the lodge’s superb new deck – or even better, from the comfort of the hammock or plunge pool on your private deck! After breakfast you can head off to the lodge’s excellent hide to do some close-up photography of the animals coming in to drink at a nearby waterhole – or why not wallow in comfort yourself in your private plunge pool or head to the Africology Spa for a pampering massage! Lodge guests consistently rave about the friendliness of the staff and service, whilst the excellent dining also gets singled out for special praise – it’s going to take a fair amount of willpower not to return home with an expanded waistline! 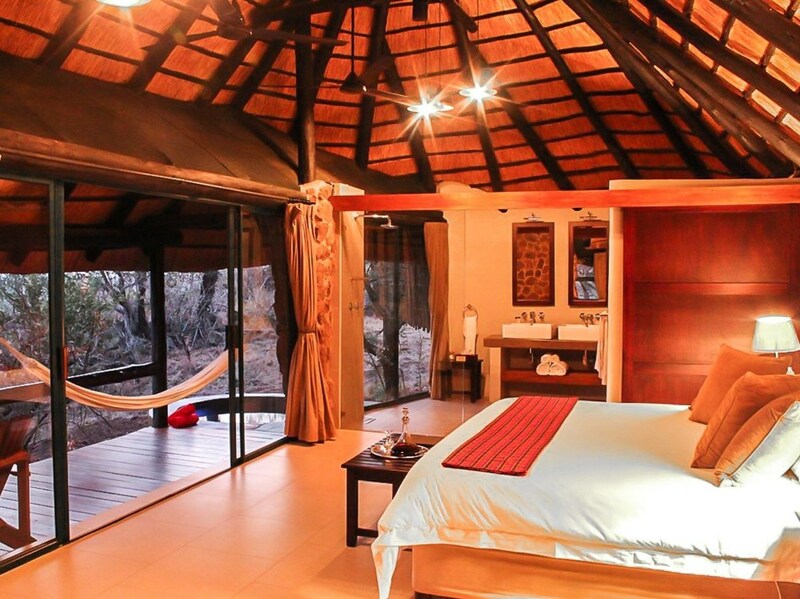 gaze out at the stunning views of the mountains and Msunduzi river winding below from the comfort of the cavernous, soft bed or from your deck complete with hammock and plunge pool! 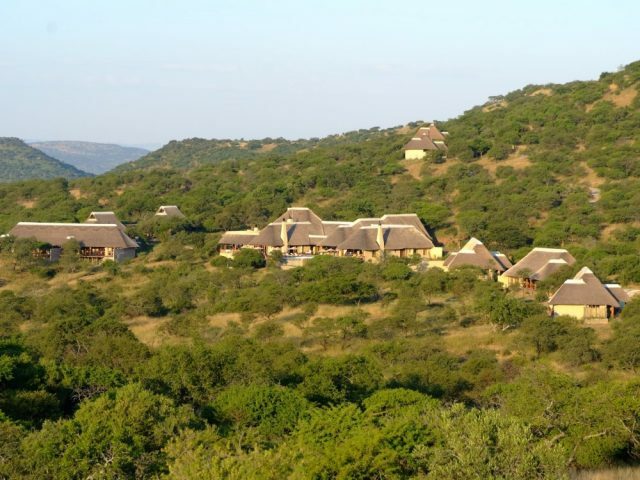 Lying on cliff tops just off the banks of the Msunduzi River in the Manyoni Private Game Reserve (previously known as the Zululand Rhino Reserve), Leopard Mountain’s 8 stone chalets are welcoming and warm and the most luxurious and upmarket accommodation available in the reserve. Though made from stone, these chalets also exhibit some chic and contemporary features like private plunge pools, air-conditioning and frameless glass showers so that they offer a perfect blend between old-style warmth and contemporary style. “Light and spacious” are the words used on the lodge’s website to describe the rooms and it’s immediately clear why: ample windows and wide, floor-to-ceiling doors open up effectively to let the space breath and there is very attractive seamless open-plan flow linking the sleeping area into the bathroom with its chic feature shower and twin vanities. The effect is clean, unfussy and airily spacious – altogether very attractive indeed! Best of all, you can gaze out at the stunning views of the mountains and Msunduzi river winding below from the comfort of the cavernous, soft bed with its top quality linen or even whilst you take a shower – otherwise a few steps will take you out onto your small private deck complete with plunge pool from where you can gaze out across the rolling mountains of the Lebombo range. So you’re never more than a few steps from a refreshing dip or those mesmerising views that Leopard Mountain is so widely renowned for. And there’s even a hammock to laze in. Our suggestion? Grab a bottle of bubbly and take some time out on your deck to let all that beauty roll over you. If you can drag yourself away from the tempting comforts of your room, the good news is that the safari experience at Leopard Mountain isn’t shabby either. The rangers are knowledgeable and keen to show you the very best that this scenic reserve has to offer. 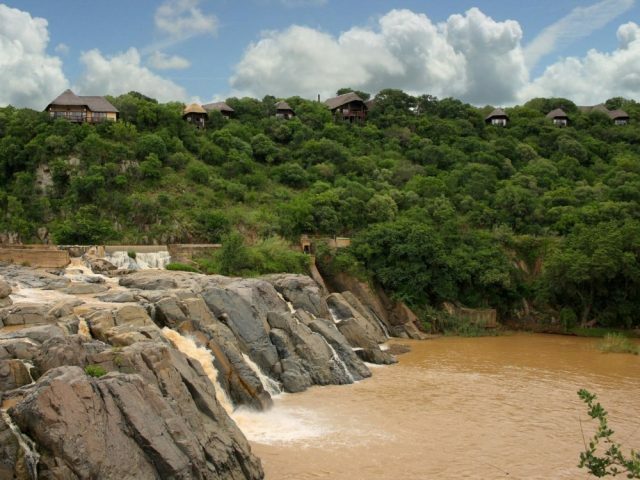 The Manyoni Reserve is one of the more recent private reserves to have been established in KwaZulu Natal. The 23 000-hectare reserve formed in 2004 was previously known as the Zululand Rhino Reserve, a name reflecting how in 2005 it was chosen as a release site for a founder population of black rhino as part of the WWF’s Black Rhino Range Expansion Project. 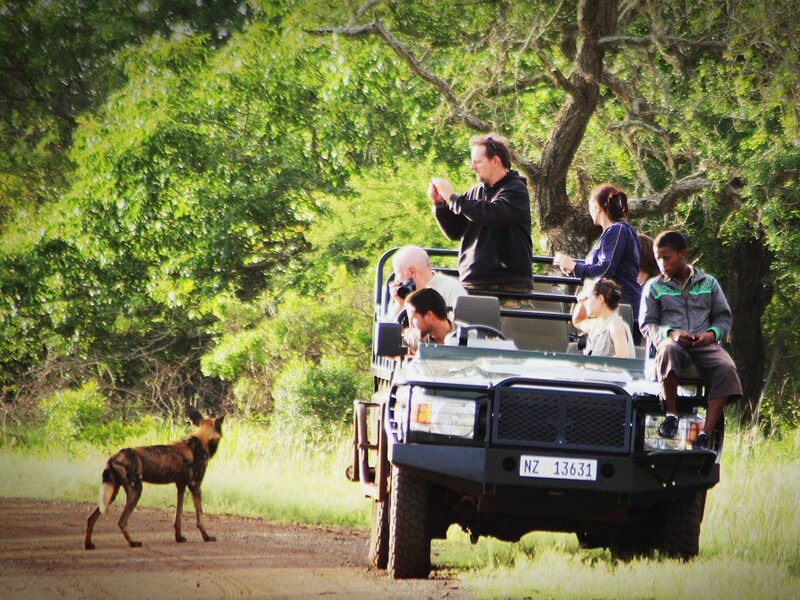 A herd of elephant from Kruger followed, with cheetah re-introduced in 2009, lion in 2011, and the reserve’s latest introduction being a pack of Africa’s most endangered predator: wild dogs! Game viewing has improved steadily over the years and whilst perhaps not yet at the same level as longer established reserves like Phinda, it provides for very decent game viewing in one of the county’s most scenically attractive reserves. 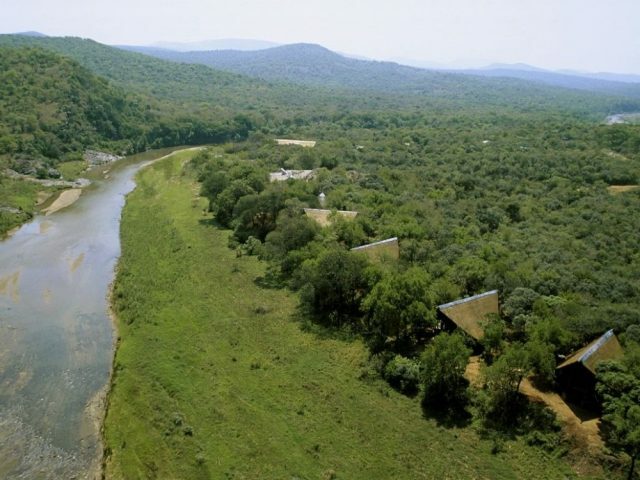 The Manyoni River, teeming with bird life (Manyoni means “place of birds” in isiZulu) winds its way through the centre of the reserve also characterised by rolling hills and valleys. A highlight not to be missed is heading off after breakfast to the lodge’s excellent hide where you can enjoy close-up views of the animals as they come down to drink at the waterhole! Children are welcome to share a standard chalet with parents (triple only) but a single room will have to be booked to ensure the lodge is not overbooked. All children will be charged adult rates.